They are quick growing, so the process is simple. You sow, they grow - and then you dig them in. In just a few weeks their green foliage returns the nutrients to the soil. Soil fertility – with their deep root systems, green manures gather nutrients from depths that ordinary vegetables rarely reach. Plants from the legume family, such as clover and vetch, also absorb nitrogen from the air and fix it in nodules on their roots. Once the green plant is mature, by digging it back into the soil all the nutrients are returned as the plant decomposes. This process also feeds the millions of small microcosms in the soil, stimulating them into creating a healthy rich growing medium. Improved soil structure – whether your soil is heavy and clay-like, or light and sandy, green manures can help rectify any problems. The extensive, and sometimes deeply penetrating, root system of green manures will open up heavy soils, allowing better drainage. In light soils, these roots remain closely bound to the soil particles and act as a sponge. They hold onto moisture and nutrients, and prevent them from being washed out. Weed suppression - nature takes advantage of bare soil. Weeds will quickly populate any area not in cultivation. A cover of quick growing green manures such as mustard will smother young weed seedlings, and save you hoeing to keep the soil weed-free. Clover provides an excellent long term cover crop. When sown, you will find a first flush of weeds competing with the clover. Cut them all back and the clover will thrive on a second growth, outgrowing the weeds, and building up valuable nitrogen in the soil, ready for when you dig it in. Pest control If you sow a small patch of crimson clover or Phacelia tanacetifolia their vibrant flowers attract bees and hoverflies – which are invaluable at eating aphids. Research has also shown that some flying pests can be confused if the outlines of their food plant are disguised. 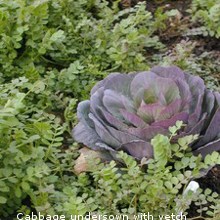 For example, under-planting brassica plants with trefoil or vetch disguises the outline of the crop and seems to confuse and deter cabbage root fly. Slug predators such as frogs and beetles enjoy the cool, damp ground under a green manure cover crop. So, how do I grow them and when? Check this list of Popular Green Manures to make sure you choose the right green manure plant for your soil, when and where you want to grow it. Green manure seeds can be sown from spring through to autumn. Use green manures as a ‘catch crop’. Wherever you have a bare patch of ground, after you have lifted crops such as potatoes, sow a green manure. Phacelia and mustard are quick to germinate, and can be dug in within 6 weeks of sowing. 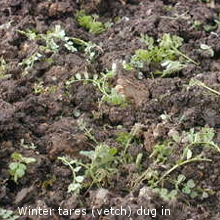 Grazing rye or winter vetch can be sown in the autumn and will keep the soil covered over winter. When the weather warms up, you can dig it in and it will provide nutrients ready for your hungry summer veg such as courgettes or runner beans. A low growing green manure, such as trefoil, will keep the ground covered between rows of a tall crop, such as sweet corn. This reduces weeds. If your new allotment soil has been overworked by previous growers, why not put one patch to green manure for the first season. Not only will that feed the soil, putting it in good heart for next year, but also you will have less area to cultivate in your first year. Grow green manure for its flowers! Crimson clover and Phacelia are gorgeous in flower. Bees love their nectar rich flowers. From Spring through to Summer, sow small patches here and there to fill in gaps both in the veg and flower beds. Vetch grown over winter under greedy blackcurrant bushes will fix nitrogen on their root nodules, ready for release during the growing season. Hoe off in spring, leaving the foliage to decompose on the soil surface. You could also grow a long-term green manure, such as white clover, around the base of fruit trees. You’ll keep weeds at bay and provide a good wildlife habitat for pest-eating predators. When do I dig them in? You need to dig in the manures three or four weeks before you want to use the ground again, or when the plants are approaching maturity - whichever comes sooner. The young green growth will quickly decompose and feed the soil. You don’t want them to get too woody, and you don’t want them to set seed. Mustard, for example, goes over very rapidly once it starts to flower, so it is best dug in when, or before, the first flower buds show. Grazing rye, a grass, forms flower buds in the heart of the plant. Once you can feel a flower bud it is time to dig the plants in. It is important to do this at least three weeks before you want to sow your new veg crop, as the rye will temporarily release substances in the soil which inhibit seed germination. This is good for keeping out weed seedlings, but you need to wait a month to sow your veg. Planting out young plants, however, is fine. To dig them in, simply turn the plants back into the soil, using a sharp spade. Chop up tough clumps as you go. Aim to bury the plants no more than 15 cm deep on heavy soils, 18 cm on light ground. Mustard and buckwheat can simply be hoed off when young, leaving the foliage in situ, or added to the compost heap. If you don’t want to dig them in, you can let tender plants get caught by frost and leave the frosted foliage in place to protect the soil. Or you can cover the plants with a light-excluding mulch, such as black plastic, or large sheets of cardboard held down by straw, logs, bricks etc. Here is a list of Popular Green Manures to help you choose the right green manure plant for your soil, when and where you want to grow it. See our practical guide, Sort out Your Soil, as well as the How to Grow cards.